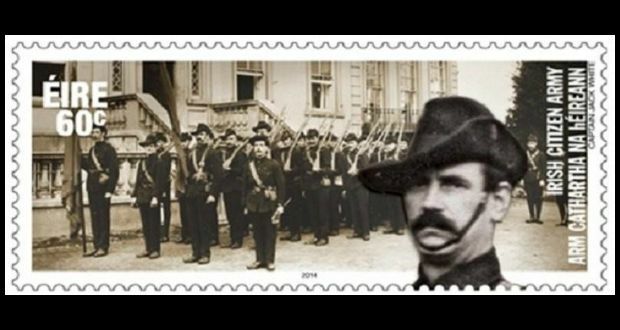 On Thursday, 23rd January, An Post was due to release the first ever stamp to commemorate the Irish Citizen Army . However , this was immediately withdrawn as controversy arose over the identification of the central figure as Captain Jack White , which has been disputed by a number of historians . To date , the stamp above or an alternative has not been reissued. The main image is one of the most famous photos of the ICA, on parade at Croydon Park , Marino. While the identity of the flag-bearer has still not been satisfactorily established, of particular interest to East Wall residents are two other ICA members who feature in the iconic picture. One of these is William Halpin , who was not an officer but was known to carry a sword when he was on parade. Halpin’s background has already been the subject of a feature last year (see http://eastwallforall.ie/?p=972). 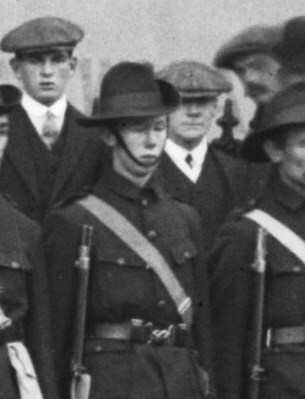 Also appearing in the parade , though slightly obscured by a rifle is John Whelan, an ICA Private, veteran of the 1916 Rising, and for many years a resident of East Wall, living at number 64 Seaview Avenue. John Whelan was born at 21 Phoenix Street, Smithfield, on 9th December 1879. Little is known about his early life other than that his parents Thomas and Mary were married at Saint Andrew’s Church, Westland Row, in 1873. Whelan joined the Irish Transport and General Workers Union (ITGWU) on 20th May 1911, while working for W.W. Roberts. On 8th January 1913 he married Cecelia Connolly at the Pro Cathedral. Celebrations were short lived as this was the year of the Great Lockout , and as a union man Whelan became involved in the turmoil engulfing the city. He quickly found himself jailed in Kilmainham later in the year , convicted of disorderly conduct during a protest. He joined the Irish Citizen Army on their formation and continued with them through to the Rebellion of 1916 and beyond. “In front of the hall itself, the Citizen Army cleared a space and formed up on three sides of the square. Inside the square was the women’s section, the boy scouts corps under Captain W. Carpenter and the Fintan Lalor Pipe Band. 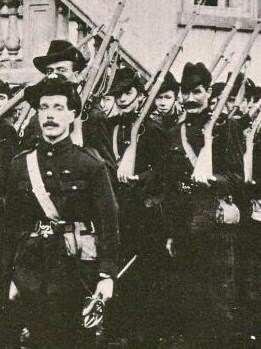 Captain C.Poole and a colour guard of 16 men escorted the colour bearer, Miss Mollie O’Reilly of the Womens Worker’s Union who was also a member of the Citizen Army. With her were three young girl dancers known as ‘The Liberty Trio’. From that time onward he was part of the permanent group of Citizen Army based at Liberty Hall in preparation for the rebellion. Here they assembled munitions , made bombs and the Proclamation was printed. 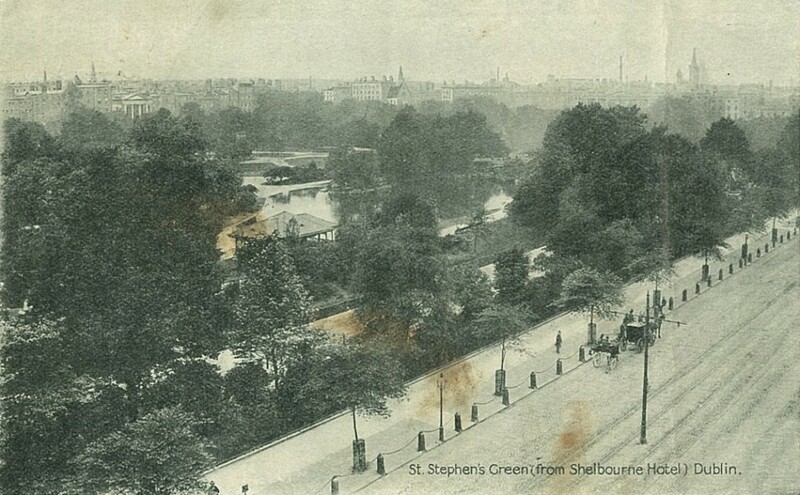 On Easter Monday, as the rising began he marched to Stephen’s Green under the command of Michael Mallin . Here he was engaged in digging trenches near the Cuffe Street Gate. One of the first of Citizen Army men to die in this engagement was James Corcoran . The thirty three year old father of three (originally from Gorey , County Wexford) worked as a labourer on the Docks for Burns and Lairds at North Wall , and had lived at a variety of addresses in Oriel Street /Seville place. Corcoran was in a trench when he was hit in the back of the neck by machine gun fire from the fourth floor of the Shelbourne hotel. 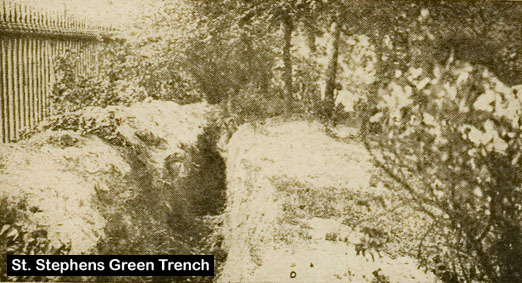 An account by Citizen Army man James O’Shea recalls: “A little after that and from time to time , I heard Commandant Mallin’s whistle going, so I prepared to vacate the trench. I had a hard time moving from tree to tree, as every time I moved the tree got a couple of bullets, so I knew the men on the other side understood their business… I threw myself down and took cover. Madame Markievicz, who with a number of others was taking cover at this spot, told me we were to evacuate ‘the green’ and go to the college of surgeons. I had to wait nearly an hour , as men were moving in groups to the college and everything was being done in very orderly fashion”. “The plan was that, as the gunner prepared to change his spent magazine, the volunteers would run across the road to the side door of the college on York Street. Each unit would only have a few seconds to cover the distance of over one hundred yards of open ground. The order to ‘make ready’ was shouted down the line as the men edged nearer to the gate…The machine -gunner ceased firing in order to change his magazine. At the park entrance Captain Poole mustered the men, and in separate sections they put their heads down and ran out the West gate towards the college. Within seconds, gunfire erupted and bullets went whistling past the running figures. They made for the side door of the college in York Street. As they reached the door and looked back, one of their numbers lay in the roadway. The volunteer in the roadway lay still as the machine-gunner traversed his weapon, spraying the front of the College building. The volunteer feigning death waited till the gunner had expended his magazine and was reloading. As the firing stopped, he jumped to his feet and sprinted the rest of the way, arriving at the college uninjured”. He remained on duty there until the general surrender on Sunday afternoon. He was deported , initially to Stafford Jail in England before being sent to the Frongoch camp in Wales. He was amongst the many prisoners to be released in December of 1916. On his return to Dublin Whelan immediately rejoined the ICA.He was one of those who took part in the funeral of Thomas Ashe, as a member of the ICA firing party. Ash was a member of the Irish Volunteers , and had taken part in the 1916 Rising in Ashbourne County Meath . Forces under his command took part in one of the most successful engagements of the Rising and defeated a much larger British force , even seizing a large number of enemy vehicles. In 1917 Ashe was convicted of making a seditious speech and jailed at Mountjoy where he took part in a hunger strike in demand of political status. After brutal force feeding he died in the nearby Mater hospital. 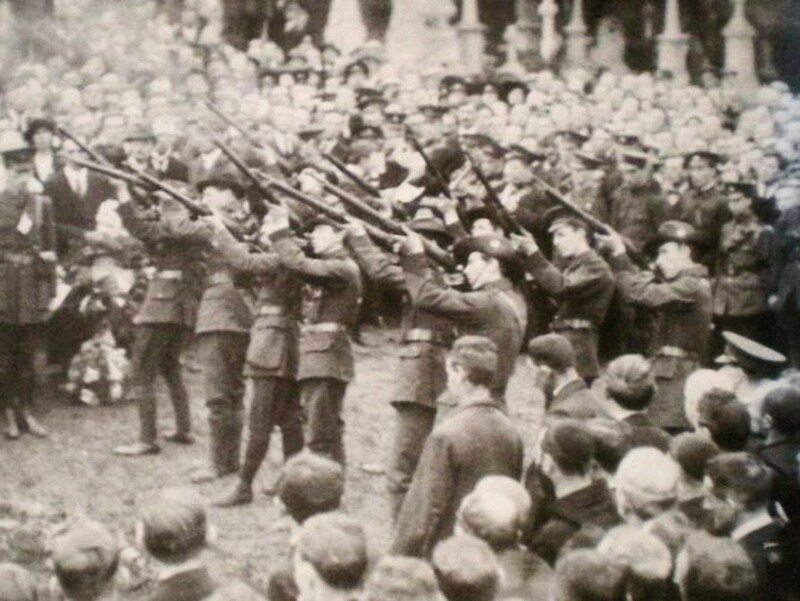 His funeral cortege to Glasnevin was followed by 30,000 mourners and the Citizen Army was represented in the graveside firing party. 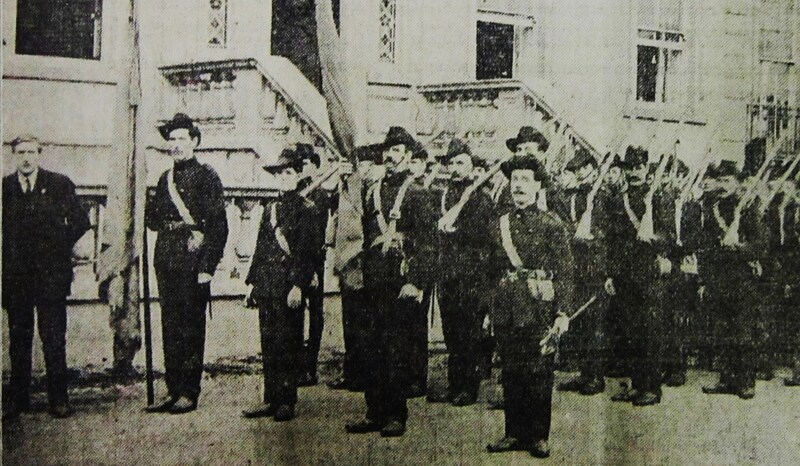 John Whelan is believed to be fourth from the left. His return to the Citizen Army was short lived as he was increasingly suffering from sciatica and found it impossible to continue with the routine drilling and marching associated with ICA involvement. 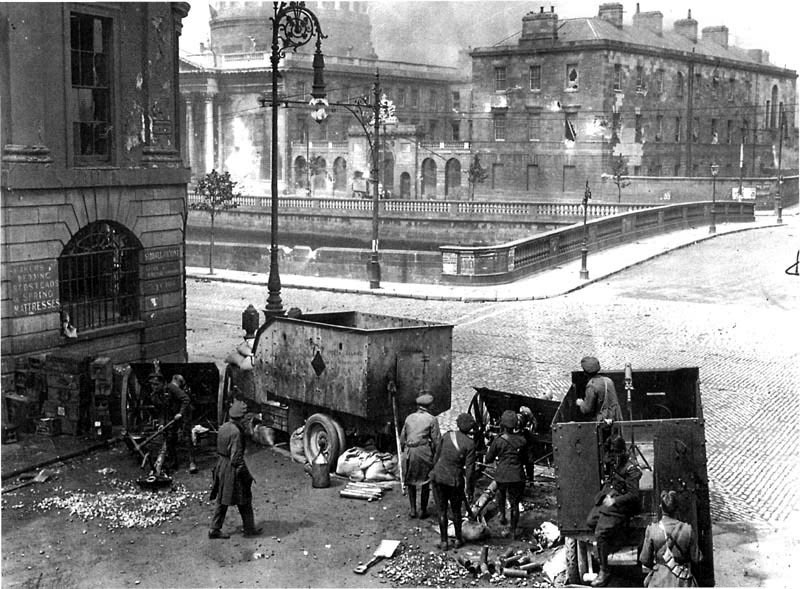 However he later joined the 5th Engineers Battalion of the IRA and in 1921 was involved in the occupation of the Four Courts at the outbreak of the Civil War , quite close to his birthplace. Following the bombardment by the Free State Army, Whelan was captured and interned in Mountjoy until July 1922. After the Civil War he ceased all military involvement. At this time he was living at 14 Newcomen Court. He worked for Brooks Thomas, and later as a civilian worker with the engineers at Collins Barracks. He would continue his employment here until forced to retire at the age of 71. In 1935 he moved to East Wall, to number 64 Seaview Avenue, where he died on the 19th January 1960. John Whelan served alongside Walter and Peter Carpenter (formerly of Caledon Road) and Daniel Courtney (formerly of Merchants Road and North Wall ) , all members of the Citizen Army from it’s earliest days . The East Wall History Group is engaged in a long term project to publicise the stories of all the men and women connected to the North Docks who were active during Ireland’s Revolutionary period. We are working closely with historian Hugo McGuinness , who we are in debt to for sharing his expertise. If you can contribute in any way to this aspect of our work please get in touch . Clarifications, corrections and additional information is welcome. We are looking to hear your family or community stories about this period , and get copies of any photos , documents or other memorabilia .